The only time I had my mother to myself – apart from the day I was born – she was dead. She had died two hours earlier and I was the first of my family to arrive for a viewing of her body without her in it. ‘Wake up,’ I said, for a moment forgetting she had gone, and I touched her face with my hand. Cold to the touch as you’d expect. The coldness of death and still. As a small child I dreaded this day. I could not then have imagined a life without my mother. But so many years had passed and I had grown accustomed to a different relationship, one in which my mother became almost a stranger to me, and certainly I had estranged myself from her. Throughout my adulthood, I visited often enough, sometimes for birthdays, rarely at Christmas and at other times simply to say hello. But beyond the hello I said little. I talked about inanities, the things that might help to pass the time. I told her about my children’s achievements, their milestones, and listened as she told me about the achievements of my siblings and their children. superficial, otherwise my mother might bring up God and religion and then I’d feel thoroughly bricked out. Still there were many times when I hoped she might ask after me. But she had decided that I was a busy person, hence my long absences. She became convinced I did not have time for her. The room in the Bethlehem hospice was arranged to give the appearance of a normal bedroom, a tapestry quilt on the bed, a sprig of peonies on her pillow. The bed was white and wooden, a single child’s bed from another era and it looked strange to see my mother in such a small bed, not that she’d have needed a larger one. Her body had shrunk after nearly ninety-five years and she had lost height. My older sister was next to arrive after me and she and I sat opposite one another one on either side of my mother. 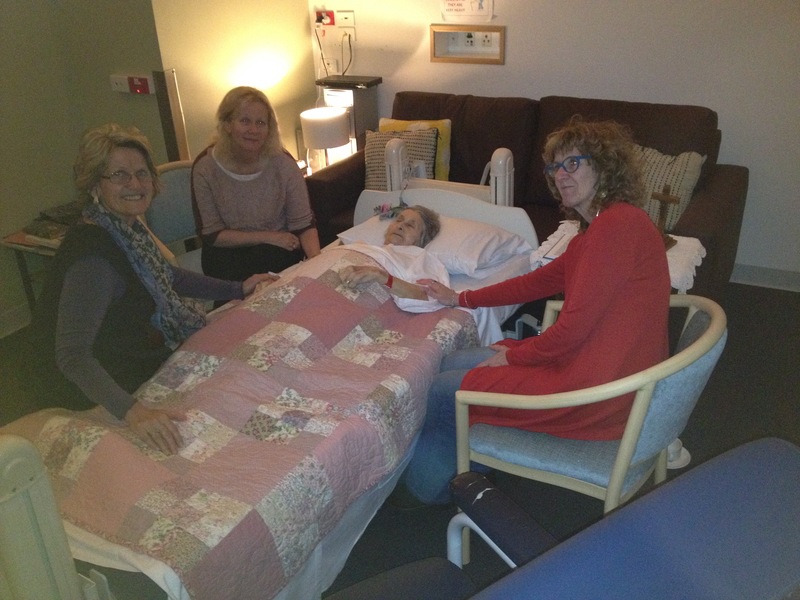 My sister held my mother’s hand, then a brother arrived, my mother’s youngest, one who had not seen much of our mother these past several years but as luck would have it he was staying in Melbourne at the time of her death and could not keep away. The sister one above him arrived next and some time later another brother from the country. Those who lived interstate did not make it to our mother’s bedside, only one refused to come to her funeral. That would have disappointed her. My mother had told me often enough. ‘You’ll get together again but only for my funeral.’ She said this with a hint of sadness, as if it meant a great deal for her to know her children could come together once more as a group before she died. All nine of us came together only once before her death without our mother, and my older sister told our mother about the reunion soon after, fearful that our mother might have felt excluded. We did not include her as we considered her presence might have made it more difficult to speak openly to one another. And my sister was relieved to tell me that rather than feeling excluded our mother had said she was pleased. Not so on her ninety fourth birthday, when my sister and I took her out to the Parkmore hotel for lunch. And we were joined by several members of my sister’s tribe who lived relatively close to the hotel, along with my mother’s last surviving brother in Australia. He sat with her and the rest gathered together and chatted. My mother was upset later after we brought her back to her room in the retirement village, as they’d all made a fuss of the baby, my mother’s newest great granddaughter, and neglected her on her birthday. My mother spoke like a sulky five year old, true to form – a form I have felt at times, but hidden – that wish to be noticed. My mother had sacrificed everything for her children, but by the end of her life her selflessness got the better of her and the desperate need of her small child-self, to be seen and heard, erupted in bitterness, as if she were competing with a baby. I’ve never viewed a body or attended a wake. I’ve been in a room with a dead body twice and maybe even twice when a body died (although I might’ve been on the phone in the next room when my mother passed but I think not) but that’s it. My brother went to see Mum at the funeral parlour and swore he’d never do that again. The body in the box wasn’t his mother. None of us went to see Dad’s corpse. I don’t expect any one of us even thought we ought. I forget if my sister went to see Mum. I don’t think she did. The only time I was alone with my mother after her death was while we were waiting on the undertaker. The medics had carried her into the next room where her bed was—this was downstairs because she refused to sleep in what had been the marital bed and none of us said she was just being silly—and I sat at the foot for a bit. They’d covered her up and I felt a bit stupid to be honest. I do remember saying her name once, “Mum,” but it felt affected, not me. I loved my mother because I was hard-wired to do so but it was duty that drove me to step up when Dad died. That and the fact my siblings had buggered off to England whereas I was only a walk, a bus and a train ride and another walk away. Like you I found it hard to imagine a world without my parents in it but a part of me was relieved to find myself living in one. I’ve never understood Christians making such a palaver about dying when that marks the end of their suffering; they close their eyes and open them and they’re in heaven or in Paradise. No one imagines they won’t be granted admittance. My mother’s beliefs were important to her and she was “faithful unto death.” Now she’ll know if it was all worth it. Or she won’t know anything. Either way she’ll be at peace.